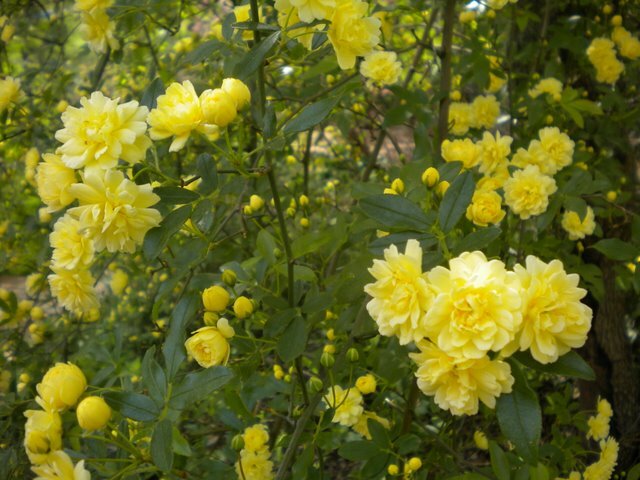 If I had to choose two roses – well maybe six or seven – to replant on Mt. Faith in Minnesota, it would certainly include my lovely Paul’s Himalayan Musk that I wrote about in a previous post, and also the Rosa banksiae Lutea. Except that when I consult all the Rosarian experts, it seems that the banksiae will not translate to the cold winter climes. It likes a warm wall or a sheltered but sunny spot. And Peter Beales in his book simply entitled “Roses” (and he is the go-to-guy for rosarians) says that “In some parts of the world where frosty winters are NOT in the normal course of events, “Banks” roses flourish and are taken for granted, almost to the point of dismissal as weeds. In colder climates however they are cherished as rarities and treasured for the beautiful display of scented flowers they provide each spring.” Well, I’m taking that as a NO for Minnesota. Darn. So now I’m running outside every few hours to just gawk at the splendor. Will I never see it again? My lovely Lady Banks. When we first moved to Castenada Lane, there was a small dead oak tree in the back garden. And it was right by the side of the “dining deck” across from the goldfish pond. Obviously it could not stay. 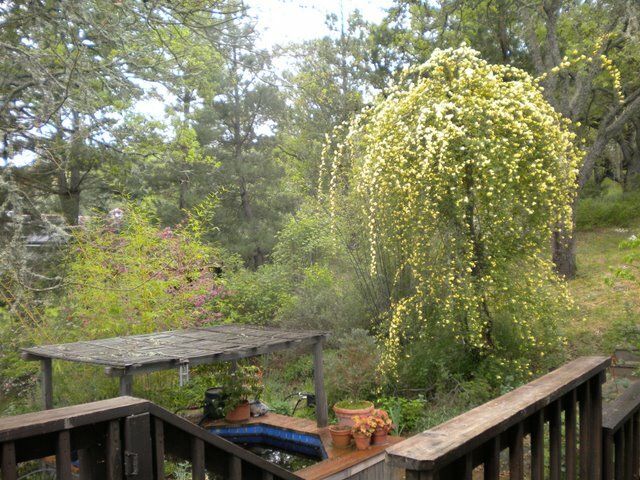 But one moment of serendipity out of the blue made me envision what now after all these years, made me choose to plant a Rosa banksiae Lutea at its base. The rose now climbs at least 20 feet or more and drapes down another 10 feet at least. What a show. My only fear each winter when the winds howl through the oak trees and limbs fall throughout the garden, is that the compromised small dead oak will succumb to Mother Nature and come crashing down. What of my lovely Lady Banks then? The Banksiae is an old rose from China. There is a white version – “Alba-plena” and a pale yellow single “Lutescens” and the “Lutea” which grows with double butter yellow flowers on long thornless canes. It is said that they all smell of violets. It is called Lady Banks (properly only the white, but I call mine Lady Banks too) after the wife of Sir Joseph Banks, a noted horticulturalist in the England of the early 1800’s. It bothered me that she was always referred to as “Lady Banks, wife of Sir Joseph”, as if a woman wasn’t important enough to be identified by anything more than her husband’s title. I looked through all my rose books and finally found the answer. Her name was Dorothea! So now I call my rose LADY DOROTHEA BANKS! There’s a story that goes around in Rosarian circles about the famous example that grows in Tombstone, Arizona. It is said to have a trunk of 12 feet wide, and that is really hard to believe. And covers 8,000 square feet of the roof of an Inn. I’d like some of my transplanted true snowbird cousins in Arizona to go check it out. Sadly there won’t be one on Mt. Faith so I’m really enjoying it now. Oh how beautiful the Lady Banks roses were in AZ. I think if you go to this site at Bachmans, plants.Bachmanslandscaping.com/, it will give you all the info you will need for a specific plant, tree, or shrub. Let me know if you need more. I had sent you a nice long e with the wrong address, so will talk to you soon!